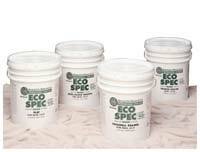 EcoSpec latex paint is an interior 100-percent acrylic system designed for commercial applications. It contains no solvents that release volatile organic compounds into the air. It dries rapidly, allowing users to paint a space and put back into use within two hours after the job is complete. The system includes a primer and three top-coat finishes — flat, eggshell and semi-gloss. It is available in white and more than 1,000 custom colors. It has been awarded the Greenguard and Green Seal certification.